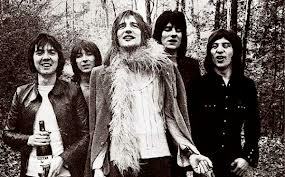 The Faces are an English rock band formed in 1969 by members of the Small Faces after lead singer/guitarist Steve Marriott left that group to form Humble Pie. The remaining Small Faces – Ian McLagan (keyboards), Ronnie Lane (bass), and Kenney Jones (drums and percussion)—were joined by Ronnie Wood (guitar) and Rod Stewart (lead vocals), both from The Jeff Beck Group, and the new line-up was renamed the Faces. The Faces released four studio albums and toured regularly until the autumn of 1975, although Stewart simultaneously pursued a solo recording career, and during the band’s final year Wood also toured with The Rolling Stones, whom he later joined. In May 2010, the Faces announced plans to reform with former Simply Red vocalist Mick Hucknall as their guest vocalist. The Small Faces/Faces were inducted into the Rock and Roll Hall of Fame in 2012.On March 23, the Faces announced that they would reunite with Rod Stewart to play at the induction ceremony for the first time in 19 years. However, on the eve of the ceremony, Stewart bowed out owing to a bout of influenza and Hucknall was asked to sing in his stead. In June 2013, speaking in an interview on YouTube, Kenney Jones confirmed the band’s intention to reunite with Stewart for a tour in 2014.